This is famous in Bangkok for lots of shopping. 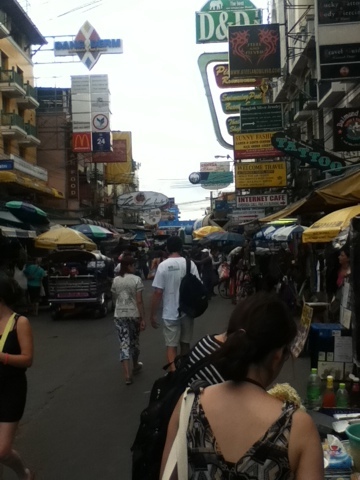 It is one long street where you can buy clothing and usual touristy things. I bought a lot of dresses and a few shirts here. We stayed in this area. I loved it there because it I walking distance to the Grand Palace and Wat Pho. The latter to follow in another post. However, for those who live in Asia, particularly those used to night markets Khao San Road isn't all that exciting but you have a lot o Thailand style stuff to purchase.